The Learning Experience, a well-known Early Education Preschool, will be opening their first center in Arizona in mid-2017. The first location will be in the community of Eastmark! This community prides itself on education and this new fast-growing center will be a perfect match. The Learning Experience caters to children 6 weeks of age to 6 years old. This school offers innovative and leading edge curriculum programs that will lead the children to success. The center expects 9 out of 10 of their students to learn to read before they begin kindergarten. The center plans to offer free enrichment programs such as; philanthropy, Yippee 4 Yoga™, Music 4 Me®, Movin’ N Groovin’®, manners and etiquette, and foreign languages. The school is expected to open in mid-2017 and will be located north of the Sequoia Pathfinder Academy, just off the Eastmark Great Park. For more information about The Learning Experience including how to pre-enroll at the new Eastmark location, please call 888-991-4222 or send an email to info@tlecorp.com. 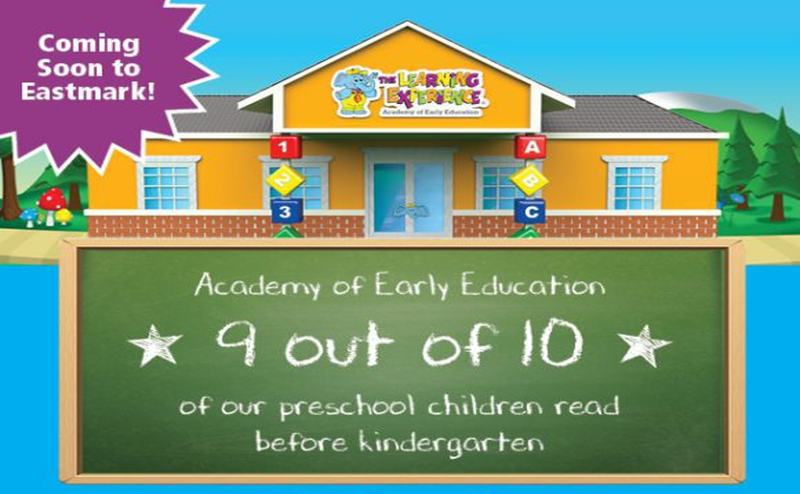 If you would like to learn more about The Learning Experience, visit their website at www.thelearningexperience.com.